Stop by stand 333 to see the range of ingredients. New polyquaterniums on display at stand J70. For the beginning cosmetic chemist, here�s a primer of the science, art and the secret tricks of the trade to create great hair shampoo, body wash and hand soap. 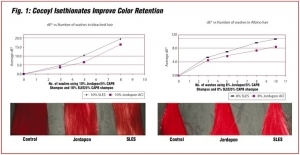 BASF researchers explain how two ingredients, ammonium cocoyl isethionate and polyquaternium-87, can help formulators create hair care products that keep color from fading. Consumer demand for novel products has forced the industry to move beyond ordinary cream rinses. Here are some new ideas in formulation.